Kevin Cooke, a veterans’ counselor in Putnam County, has experienced his own share of stress. 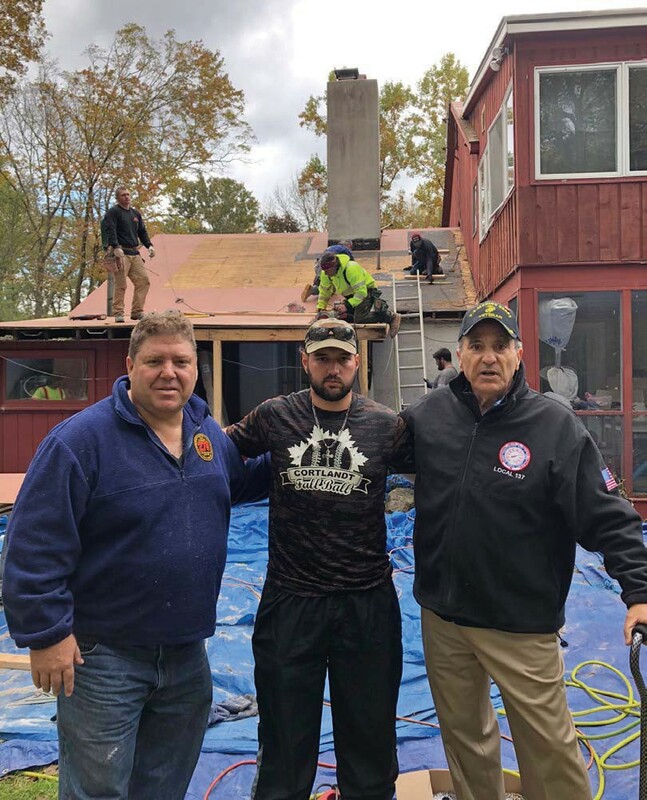 After a tree destroyed his roof, his young family was at loose ends – until volunteers from a local union came to their rescue. The Putnam Valley man, 33, enlisted in the military the day after Sept. 11, 2001, and was medically discharged eight years later as the result of serious wounds received in Iraq. Married and a father of two young children, with a third on the way, Cooke was distraught in March when a 110-foot tree crashed onto his home along Lakeshore Drive during a storm, crushing his vehicle and the roof of his residence. Despite filing a claim with his insurance company, he heard little over the past eight months, and he was forced to find temporary living quarters after his home developed mold because of the damaged roof. Concerned with getting the house back in order and prioritizing his family, Cooke then emailed his bosses, Karl Rohde and Art Hanley, asking for time off to deal with the issue. Rohde contacted Pete Allegretta of Brewster, former chairman of the Putnam Joint Veterans Council and union representative for the Operating Engineers Local 137 Union, who in turn reached out to Ed Cooke (no relation), business manager of the local Carpenter’s Union. Calls were made within both locals and on two consecutive weekends, 40 to 50 volunteers from the rank and file completely replaced the roof, making the home livable again.